Happy Thursday everyone! This post is almost a repeat of one that I did with just my Copic coloring as my subject matter and introducing our second part of our Sparkle & Glitter Progressive challenge. 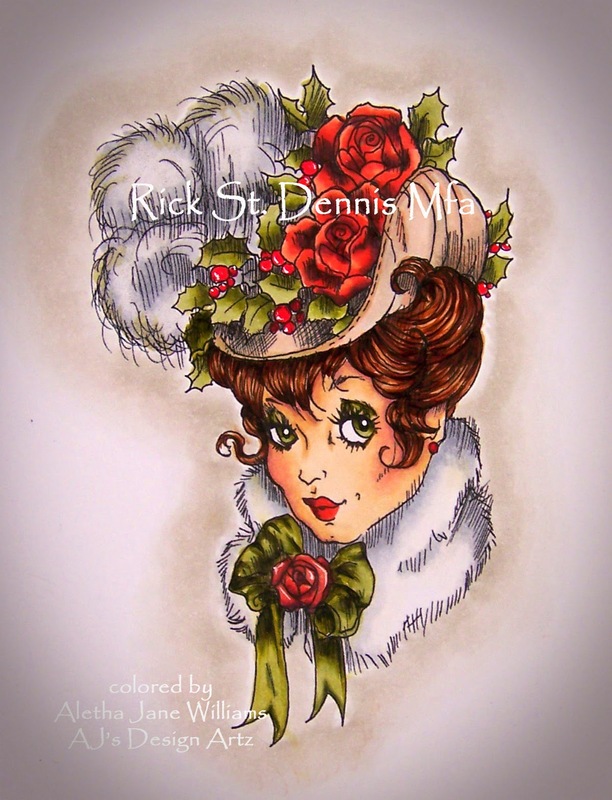 I did promise in that earlier post that I would have a project made with Rick St. Dennis’s (RSD) beautiful image “Christmas Party Hat.” That's what this post is all about. Rick has so many gorgeous images in his “hat” series. You can find them in his Etsy and Zibbet shops. 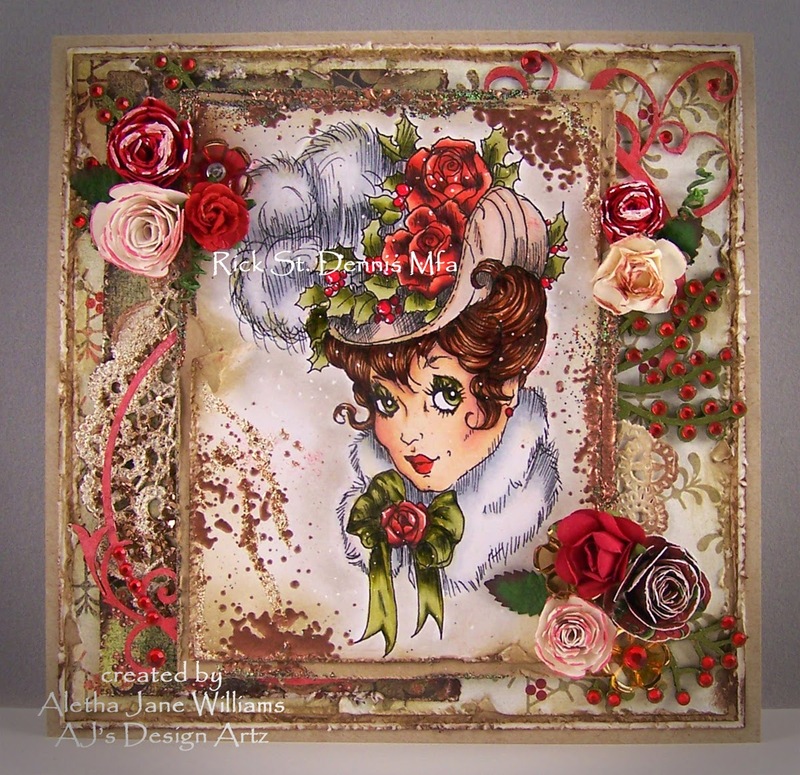 For my 6” square card I knew that I wanted to try a “Shabby Chic” style, but was very uncertain if I could pull it off. I think that I almost reached that style. I know that I still need a lot of practice, but I was rather satisfied with the finished piece. I first colored Christmas Party Hat with Copics and accented in some places with a clear glitter pen and a white gel pen. She was trimmed with some matting basics dies. After trimming, I distressed the edges on both pieces and distressed further on all edges with a light and dark brown ink. 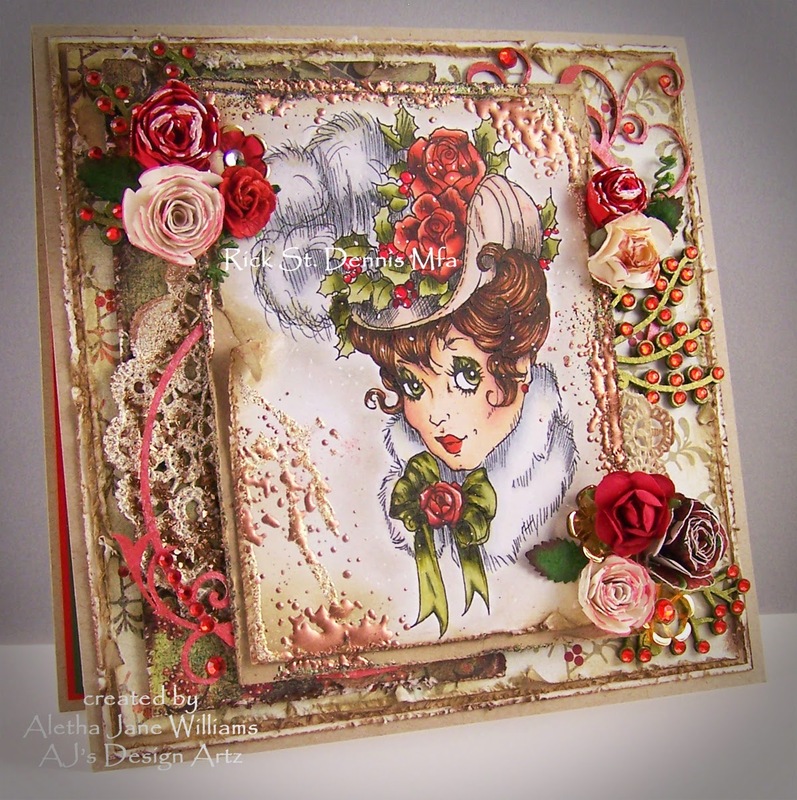 On the top piece I added some white embossing powder and ultra-thick bronze embossing powder. Background: W00, 0, 1, 2. Now it’s time to add all the details around my central image. I wanted a doily somewhere peeking out. 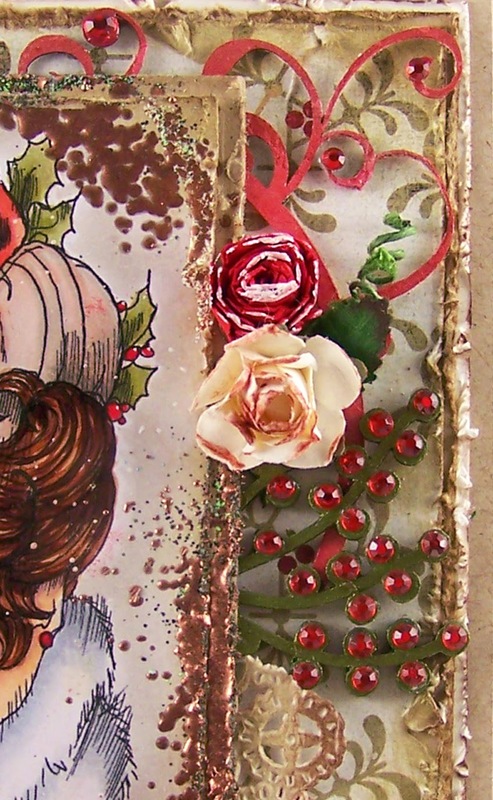 That doily is in the background enhanced with white gesso, embossing enamel, glitter glass, and brown inks. Most of my roses are handmade. 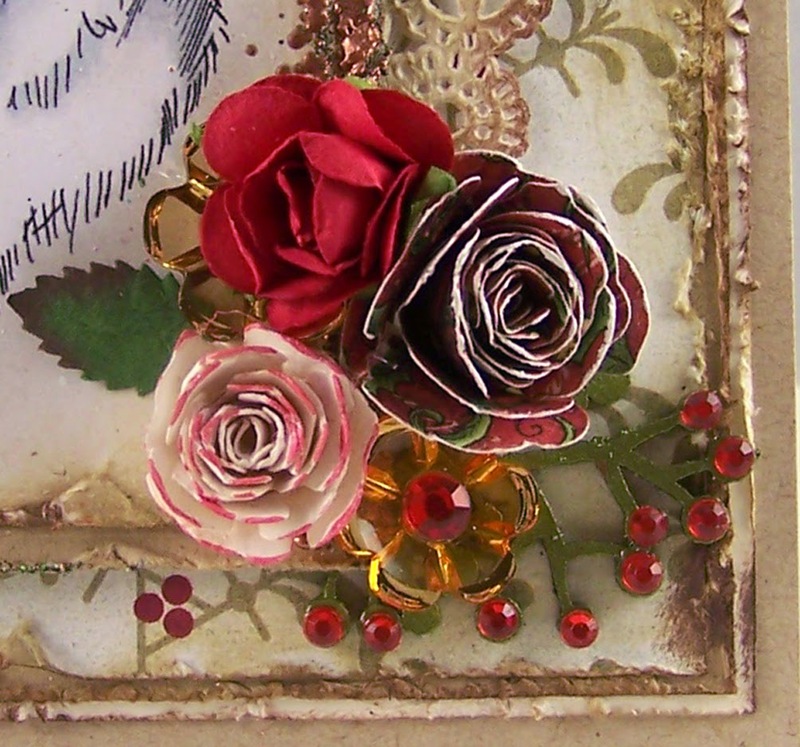 After they were completed, I dipped the edges of the roses with DecoArt white shimmer paint for the red ones, and a shimmering red paint for the white ones. The one that was made from paper got the white treatment. I wanted something that emulated holly. I found some chipboard stems that I painted with a metallic green and added red rhinestones for berries. I also found a chipboard circle frame that I spayed with some DecoArt shimmering white paint. After that was dry I daubed on some red ink on top of the white paint. It kept that shimmer. 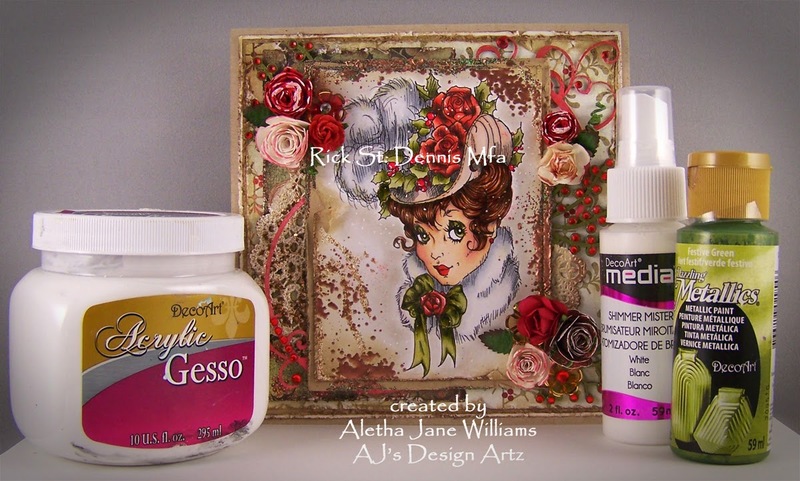 I am really enjoying my DecoArt products. I cut that in half and added to the top and bottom corners. 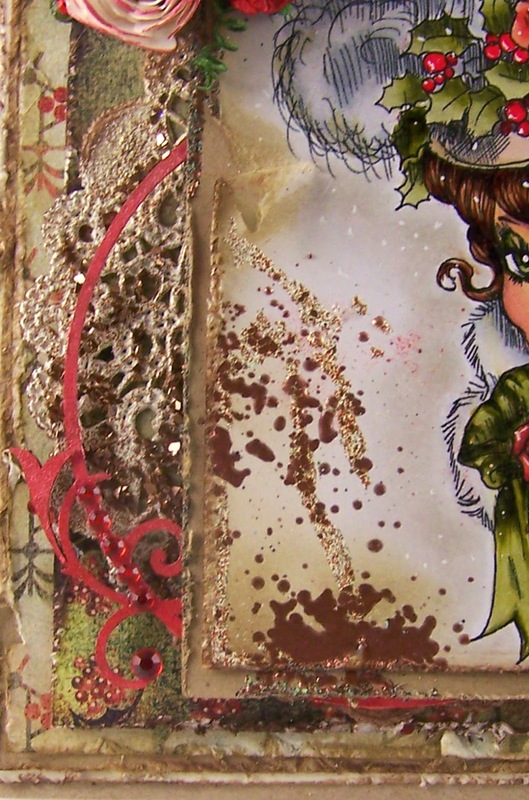 My finished piece may not be truly shabby chic, but it is definitely mixed-media. I hope you join us for our December Progressive Challenge Part 2. To enter, (you still have a few weeks), you must use “Christmas Party Hat” within your project. 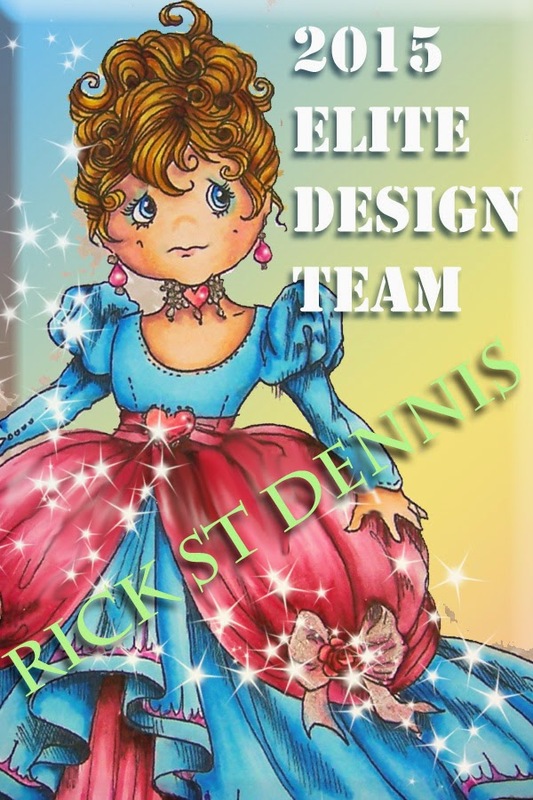 I would like to invite you to our Facebook group, Rick St. Dennis Fans and Friends. We have a bi-weekly art contest that has been lots of fun for the members. This art contest will begin again on January 5, 2015. Our blog, “Airless Chambers,” is participating in Smeared and Smudges 12 Days of Creepmas. Come join us and have some fun. Wow this is fantastic. It is so precious what you made. And it is coloured lovely.